A while ago, we have been doing some experimental studies on Navisworks. Naviswork is a 3D design review package for Microsoft Windows. Used primarily in constructoion industries alongside with Autodesk Revit, Autocad and Microstation, it allows users to open and combine 3d models, navigate them around in real-time and review the model using a set of tools, including comments, redlining, viewpoings, and measurements. There are also interesting and useful functions such as clash detection, 4dD time simulation. photorealistic rendering and PDF-like publishing. In our office, we experimented and pilot a project using Naviswork in one of the project which I am handling -- a remodelling of an existing ward in a local hospital, Changi General Hospital, we used Naviswork to monitor on the sequence of constructions (due to site constraint and to shorten time needed for renovation), location of coring etc. Although the scale of the project is very small for Naviswork, it was a good exercise in getting our hands dirty, studying Naviswork as a tool for project management (which I would be sharing in another post). 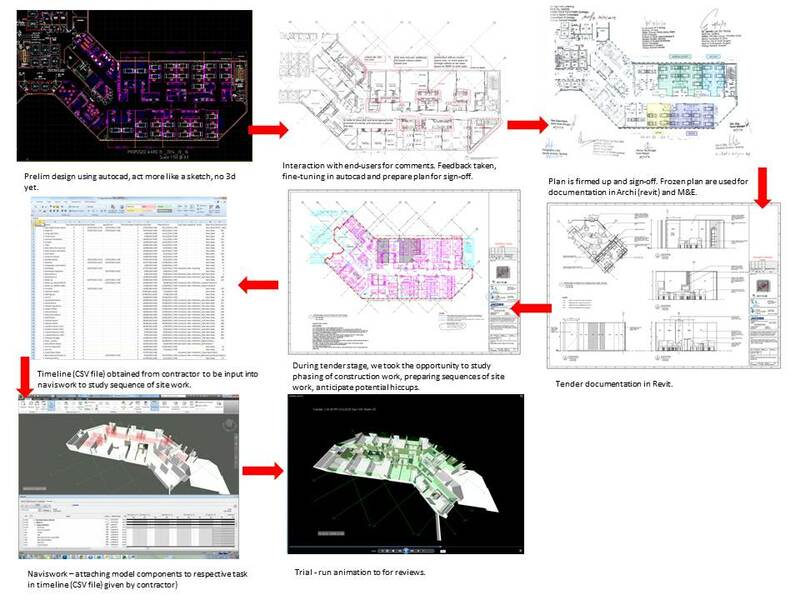 The overall process / flow of work (in general, not in detail) in carrying out a project utilising various platform (AutoCad, Revit & Naviswork), in this case Ward 15 in Changi General Hospital are as below. There are several back and forthwork involved in Revit and Naviswork since both of this software can be synchronising at the same time and changes can be reflected almost immediately. 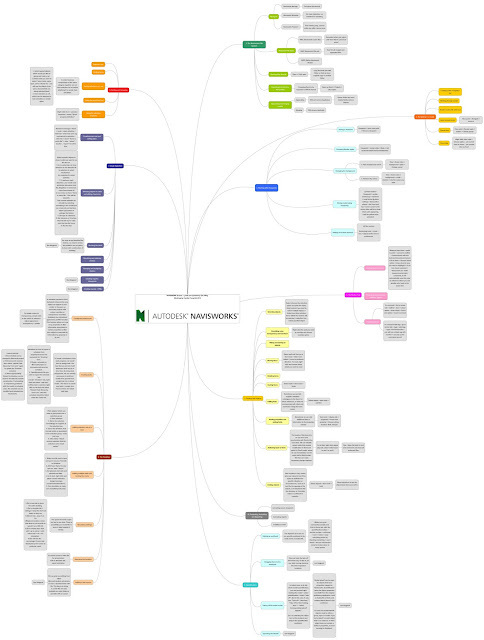 For now, I would like to share an overview mindmap of Naviswork, constructed as I was studying online via Lynda.com. The tutorials conducted by Eric Wing was amazing. The mindmap is massive, considering there are many aspects to cover in Naviswork, but trust me, it is rewarding. For the subsequent blogpost, I will be breaking down the mindmaps into smaller mindmaps with screenshots on how I practiced using Naviswork in subsequent blogposts. Disclaimer : tutorials posted here are just a record on how we practiced and experimented on the software. Please forgive/feedback if there is any error spotted as we are still baby steps in learning.